The 3-hour trek passes through some fascinating waterfalls and finally ending at a big rock connected by a bamboo bridge – Mawryngkhang. This unheard trek is one of the scariest in India, as you walk on a bridge supported by bamboos on the edge of the rock for most of the trek. The trail scares you off as you look down and find out that the bridge is the only life support between you and the valley. It gives you the Goosebumps while you trust the bamboo bridge to hold on. DRIVE TO WAKHEN,CAMPING IN WAHKHEN. We will receive you from the Guwahati at 8am and will immediately leave for Wahkhen. Wahkhen is a beautiful unexplored village in Meghalaya. Upon reaching we will set our tents. After setting our tents we will explore the Wahkhen village meeting some wonderful souls. Campsite awaits you with some warm campfire and volunteered jamming session. Stay overnight. Next morning, after breakfast we will start our trek to Mawryngkhang. 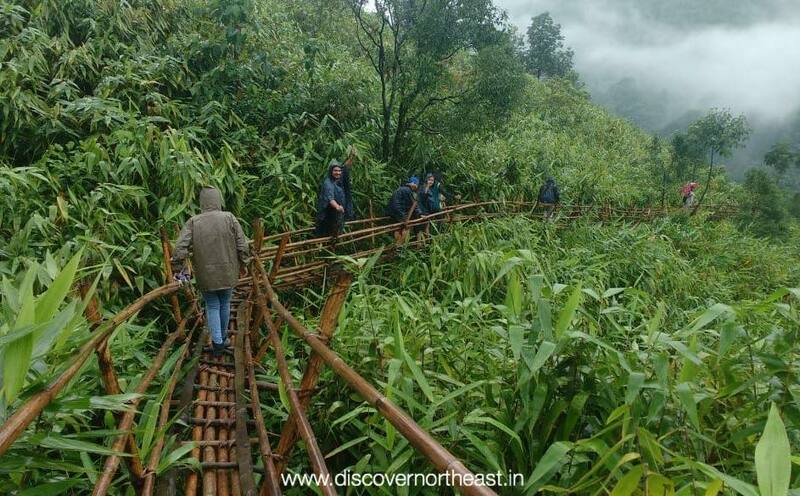 A bamboo trail for the major part of the trek on the ridges of the mountain, followed along by the cleanest river in the region ‘Umrew River’. The 3 hour trek passes through some fascinating waterfalls and finally ending at a big rock connected by bamboo bridge – Mawryngkhang. After this we will trek back to our campsite. After the lunch we will drive back to Guwahati with some beautiful memory. • 1 Breakfast, 2 lunch , 1 dinner..